Artemise felt the cold wind caress her scales as she soared through the sky, and she sighed in contentment. She could go on flying forever, if not for the dull ache in her wings, which was a warning that screamed: GET DOWN NOW OR SUFFER FROM CRAMPED WINGS FOR THE NEXT FEW DAYS! She huffed in annoyance as her wings gave another dull throb and tipped her wings downwards, descending quickly. Stretching out all four paws, she landed in a circular patch of land which was surrounded by tall, snow-capped mountains with a soft thump, sending up a puff of snow. The snow landed on her nose and she sneezed, the sound echoing around the deserted patch of land. There was no one there. Very few dragons knew this place, actually. It would be quite a surprise if someone appeared.. She yawned and stretched her wings, flopping to the ground, where the soft snow that gathered there embraced her. The dragoness stared at the beautiful wintry sky, and closed her eyes for a full 10 seconds, concentrating hard. When she opened her eyes again, snowflakes were slowly descending from the heavens, and she smiled as one of them landed on her cheek. Artemise scrambled into a sitting position and then gathered some snow in her paw, hurling the snow at nowhere in particular. She sighed as boredom settled over her. A while more of rest and she'd be flying again...back to her home this time. Even as the rest of Pyyria enjoyed the summer at its height with any remnants of cold dispersing under the unrelenting heat of the summer as flowers and blossoms bloomed giving promises of fresh smelling fragrances, the Icewing lands was never so, forever untouched left in its arctic vista. As Archeleaus stalked through the white landscape it reminded him how the snow had a purity that elevated his spirit, the Icewing lands were a world within its own, made as pristine as a book ready for new stories and adventures. Despite the necessity of his trip into the mountains for hunting, a part of him longed to dance around the snowdrifts with the delight of a hatchling as he'd done in his youth. Even the sharp icy wind always felt refreshing to him. In silence Archelaus looked up at the clear brilliance which was the white quartz like sky above him, he released a sigh of contentment as his breath in visible puffs rises to join the cold air around him. It was only then that something broke his subconscious contemplation, caught out of the corner of his eye a swift movement landed with a crystalline crunch upon the fresh snow. Initially, he allowed his primal urges to take over as he lowered himself to the ground, using his natural camouflage to blend in with the white surface as he crawled closer to where the object hit. Only due to his keen shrewd eyes did Archelaus see the blended white upon white as he looked down at a formed snowball, craning his neck he rose to a full standing position once more, his head turning to where he could assume the general direction of the throw came from. Flaring his full wingspan, he rose, taking to the air to see just who else was further upon the mountain with him. First as he took to the air, Archelaus felt the eerie sensation of isolation wondering if his mind was playing tricks upon him. Until his eyes widened, crouched in a sitting position in a clearing was a figure he vividly remembered, her shape, her colouration and wings. He began to gracefully glide downwards, his sight locked upon Artemise even as the snow feared to blind him momentarily as flakes repeatedly hit upon his brow. As he descended he thought he might of been abrupt in his first assumption, maybe he just longed for this Dragon to be Artemise and it wasn't. There was a tint of anxiety as he finally landed behind the figure, attempting with all the pomp and regal stature he could muster to seem majestic, still hoping it was Artemise. 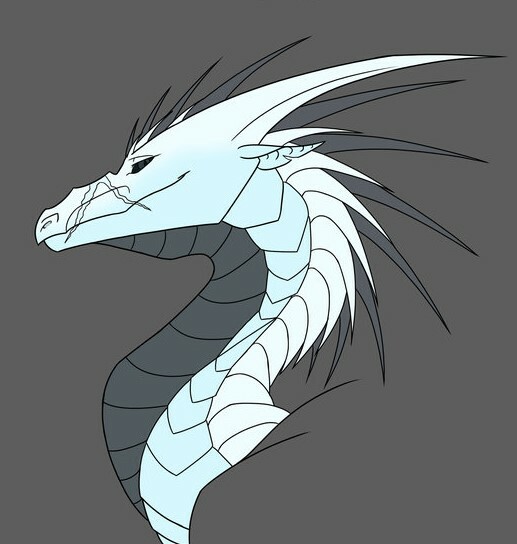 Artemise was wondering whether she should just eat some snow for fun when a glint of familiar blue-white scales in the sky caught her attention; tilting her head back to scan the grayish heavens, she frowned when she didn't see anything. Maybe it was just her imagination.. But the warm breath on her back was not. She whirled around, already preparing an excuse as to why she was in such a deserted area ("Sick. Very sick. Of my home, that is. Now go away and leave me alone.") only to meet charcoal-black eyes mere centimetres away from hers. Her breath caught in her throat. "Archelaus?" she whispered uncertainly, unwilling to tear her gaze away from his eyes just to check for the scars that confirmed him as the male she'd met at the IceWing Festivities weeks ago. She did not need confirmation from the male, though, for she could already feel her heart starting to hammer against her chest again; that was already confirmation enough. A grin spread across her face, and before she knew it, she had flung her arms around his neck. "I missed you!" Trying to ignore how intimate the touch felt, she grinned at him. As their eyes met, Archelaus couldn't help but grow his twisted wicked smile, no matter much how he attempted to make it radiate with the joy what overcame him. Bowing his head almost formally as a means of courtesy. “Artemise”, his words left his maw softly and tenderly as though her name may of been fleeting if he spoke any differently. “I hope I’m not inter-”, Archelaus’s words are cut off as Artemise wraps her arms around his neck in an embrace. For a brief moment his eyes would widen being caught off guard. Melting into the embrace his smile would return as he cranes his neck to look at Artemis, for the brief moment of silence he wishes that she’s never release him. His wings would unfold as he gently wraps them around her figure, gently brushing them against her own. “I’ve missed you as well”, Tenebris would snicker as he feels at ease. “If you don’t mind me asking, what’re you doing out here all alone?”, his words leaves his mouth with a soft coo, while his visage remains with its smirk, trying his utmost to keep her attention on his face and to hide his anxiety and nervousness as his talons fidgeted with one another in the snow. A pleased purr escaped her as Archelaus wrapped her wings around Artemise; she let go soon, though, and sead, "I wanted some peace, everyone keeps following me wherever I go; it's driving me insane. Besides that, when I want to play with the hatchlings, they ask me a lot of lame questions, like, 'Are you a dragon'?" She sighed. "Sadly, I have no patience for hatchlings..." Then, quick as an adder, her tail scooped up some snow, and hurled it at his face; she snickered. "That's my true way of greeting," she laughed, a smirk curling her lips.